Marconi Sailing Club's annual Piers race over the weekend 27/28 June had three Catapults entered for the Colne Point event of 29 miles on Sunday: Paul Ellis and Alastair Forrest were joined by Sandy Jordan of Northrop Sails in her first time there. 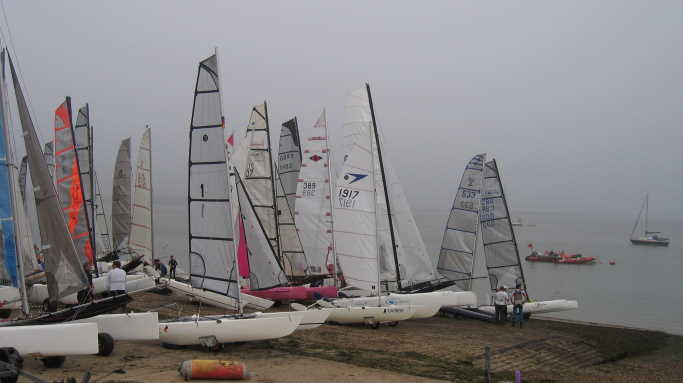 The leading boats, including Paul, took about 2 hours beating down the Blackwater Estuary in the light ESE winds, to reach the first mark just beyond Bradwell Power Station - by which time the fog had cleared sufficiently to continue to Colne Point - and a further 2 hours across to Colne Point. The faster boats (Stealths, Shadows ) did not gain much in the light wind beat all the way to Colne Point and some lost time by going too far toward the north shore of the Blackwater � the weed in the river was also always a problem for boats with long dagger boards. A Thames barge tacking slowly toward Bradwell was a large mobile obstruction for some of the fleet. On the return from Colne Point the faster spinnaker boats disappeared into the the returning fog - it was impossible to see Bradwell from Colne Point and a compass was a definite asset. It also seemed a good idea to keep the Mersea Island shore in sight! Alastair and Sandy, racing in close contact, overdid this, swinging gradually off-course north (not checking compasses) and losing time. For Catapult it was a broad reach most of the way back to MSC with the sun coming out again from Bradwell �it could almost have been a pleasant cruise down the river rather than a race. Paul finished in 5hrs 47mins in third place on handicap behind two Sprint 15s, with Alastair and Sandy in seventh and eight places in 6hrs 11 & 12mins respectively - overall a creditable result for Catapult out of 25 starters. The winner was again Jenny Ball from MSC sailing her Sprint 15. Overall the strength and direction of the wind meant that the faster boats were at at a distinct disadvantage in this years race � of the first 10 boats on handicap only Philip Neal sailing a Shadow would qualify as a �fast� cat: all the others were Sprint 15s, Catapults or Dart 18s. The winner of the Piers Race was Jenny's partner Simon Northrop of Northrop Sails, the supplier of the new Catapult sail which was being used by both Sandy and Paul. In a final twist to the day, the Club let Paul know of a prize for Outstanding Achievement in Maturity, believing him to be the oldest finisher in the two races---but chatting revealed that I beat him by a couple of years---so the Catapult fleet was again up to the podium. Unfortunately it is engraved "Old Codgers Trophy".